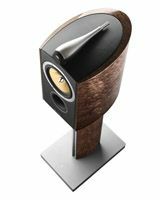 B&W announces 805 Maserati Edition loudspeaker | What Hi-Fi? New from Bowers & Wilkins is the 805 Maserati Edition loudspeaker, based on the 805 Diamond and said to 'combine the unbeatable audio performance of Bowers & Wilkins, coupled with the understated opulence of Maserati'. The new model gains a bird's eye maple veneer finish, and is trimmed with black Maserati leather, while the speaker stands supplied with the speakers are finished in the same maple veneer and feature the Maserati Trident logo, part of the car company's identity since 1926. The price of the 805 Maserati speakers is yet to be confirmed. Later in the year the speakers will be joined by a P5 Maserati Edition headphone, and both models will be premiered as part of the Seven Notes World Tour, described as 'a musical exploration of the Maserati engine that visits Dubai, Beijing, Shanghai, Tokyo, Los Angeles, New York and London', plus a Vogue tribute event during Men's Fashion Week in Milan. Seven Notes was inspired by the sound of a Maserati engine, recorded by musical and producer Howie B, who found seven notes in the sound, from which he formed a 'Maserati scale' he could then use to create music. You can download the music free at www.SevenNotes.com, either in Apple Lossless or 24-bit FLAC.